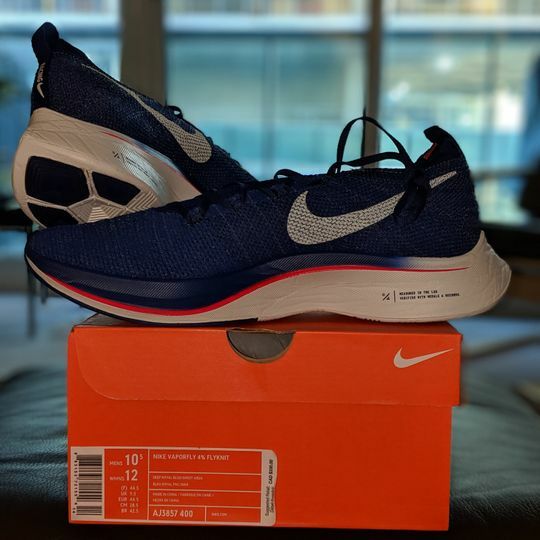 Nike VaporFly 4% Flyknit Running Shoe - Unisex Royal Blue - BlackToe Running Inc. Built to the exact needs of world-class marathoners, Nike VaporFly 4% Flyknit Unisex Running Shoe is built for record-breaking speed. The Flyknit upper is delivers breathable support, while the responsive foam and full-length plate underfoot works to propel you towards the finish line. Full-length carbon fiber plate optimizes performance. Midfoot archband provides secure lockdown. Weight: 7oz/189g (men's size 10) Last: MR-32 Offset: 10mm (21mm forefoot, 31 mm heel) Athletes: Galen Rupp, Eliud Kipchoge. All Sales of 4% are final. No refunds or exchanges. These shoes may seem a little pricey, but are definitely worth it. If you are looking to race a PB or take a shot a qualifying for Boston, these shoes have to be in your running arsenal.